There has been a lot of research and study over the years to assess what mental and physical benefits a pet dog may have on humans. What has been proven is that there are many advantages apart from the obvious benefit of companionship to the reduction of " hidden" heart problems. The change of lifestyle and improvement in health is becoming very hard to argue against. Schools are now starting to look into having "classroom pets" to encourage these benefits in our younger generations. 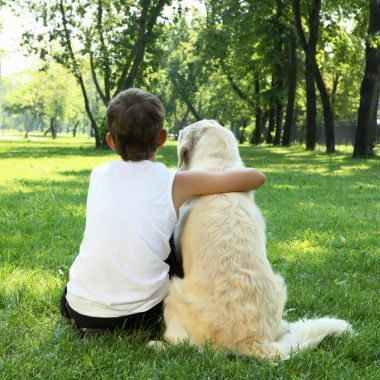 "The affectionate bond and social support provided by dogs reduces stress levels." Researchers have found that dog owners have lower blood pressure and cholesterol in comparison to people who do not have a pet. A decrease in blood pressures coincides with a drop in stress levels which can reduce future heart problems. Being less stressed means that you are more likely to be happier in relationships, at work and in the classroom. In addition to helping towards stress levels and heart problems, having a pet dog also aids depression and anxiety. Loneliness is a common cause of depression. The companionship a pet dog is able to provide helps to ward off that feeling of isolation and can make a person feel less anxious about day to day routines. Owning a dog gives you a reason to frequently get out of the house. Getting some fresh air helps to make you feel uplifted if you are down or stressed. Having a pet dog to walk gives you exercise and can also improve your social life. People feel more inclined to talk to you when your are out for a morning or evening stroll. Wanting to stroke them or talk about a common interest that may be dog related can help you to make more friends reducing the sense of segregation and loneliness. This in turn is also stress reducing. Having to frequently walk your dog can also increase your overall fitness levels through consistent amounts of exercise. We could all do with that! Regularly walking your companion can amount to the same level as jogging and it's a lot cheaper than a gym membership! Dog ownership is a great boost for the immune system too. Dogs bring germs into the house but rather than it being a negative thing it actually has a positive effect. When your immune system fights more germs and bacteria it helps your system to become stronger and more resilient to illness. An obvious bonus for employers and school teachers as the number of absentees will be lower. It has also been found that having a dog reducies the effects of allergies. Dog allergies are fairly common but having one around the house will help fight off the symptoms. But keep a close eye as allergies can be dangerous for some people if the effects escalate. So it is really no surprise that dogs are referred to as 'man's best friend'. Some people treat them like humans and when you add up the companionship and health benefits then why not......especially when they can be better company than some of your human friends. Ssshhhhh don't tell them! !